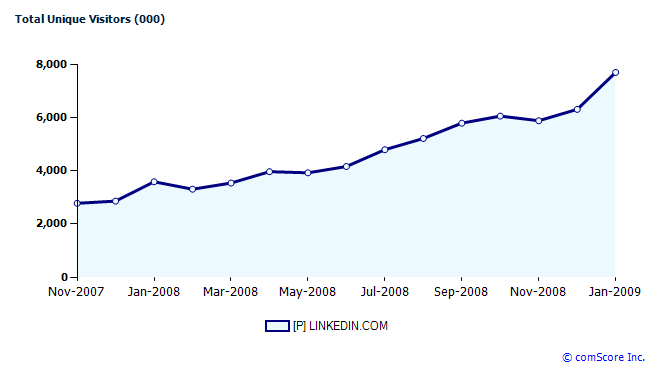 As layoffs continued to pound the economy in January, one beneficiary was job networking site LinkedIn. According to the latest January data from comScore, the LinkedIn’s U.S. unique visitors shot up 22 percent to 7.7 million, up from 6.3 million in December. Total minutes spent on the site doubled in January to 96.8 million, from 47.6 million in December. Part of what is driving all the activity is people looking for job, and helping friends who are out of work. Recommendations are up 65 percent since December, says spokesperson Kay Luo. LinkedIn’s improved people search, which it launched at the end of November, is also driving a lot of activity on the site. The company is seeing a 50 percent increase in activity on the new search platform. When times are tough, networking is a survival skill.